Subanki Sathiyanathan is an Education student on the Waterloo campus. 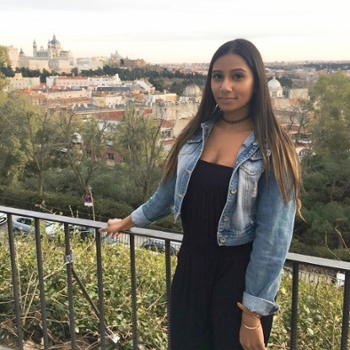 She travelled to Spain to participate in a three-week teaching program, as part of the placement required in her program. I completed my last three weeks of placement through an international program called International Volunteer HQ (IVHQ). It was a three-week teaching program located in Spain. The overall experience was completely amazing, and I would definitely do it again. We were placed at an NGO after-school program, to teach English to students that varied in ages between five and 16. In total there were five classes and four of us went together to the placement site, so we rotated between classes to get an experience of how it was to teach and be a part of all classes. Our day in Spain started off by eating breakfast at the volunteer house where we were staying. The volunteer house consisted of 16-20 people, all doing different projects around Madrid. We would always eat the lovely breakfast/lunch cooked by the staff at the house before we headed out the door. Before placement, we always tried to go sight-seeing or visit a museum (Spain is absolutely gorgeous, especially all the buildings and structures). Around 3 p.m. we would take the metro from wherever we were to head to our placement site (about an hour commute from our house). During our placement, we would greet the students as they came in, asking about their day, and for the first half of class we would help them with their school homework (English and math). Most students at the site knew very little English so it was quite difficult communicating with them. I found myself using Google translate, pictures, and hand gestures a lot. For the last half of class, we would work with the teacher in each class to plan mini-lessons and create activities to help develop their English skills. We always ended each class by playing simple games like bingo, 10, hangman, broken telephone, etc. The students were highly energetic and friendly and, although we had a language barrier, we were able to form a good relationship with the students and other teachers. After placement, we would head back to the house for dinner (which was also cooked by the staff) and then head out to the city to explore again. This is what every weekday would look like in Spain. Weekends we were off, so we were able to take the train and go to the south of Spain and travel around the beautiful country. Before we were placed in the teaching projects, we were expected to have the materials we needed, and to plan our lessons and activities similar to how we would in our placement sites in Canada. However, only after going to Spain and experiencing what the classrooms are like there, a different reality hit us. Although the kids were great, it was very difficult to obtain resources to use during our lessons. They didn’t have any lined paper or even blank paper; we always used scrap paper for the kids to write on. As well, two small pieces of an eraser were shared among the whole group, half the pencils were either broken or too small to write with and we had one whiteboard marker that barely worked. We did have access to some paint though. The resources were very limited, and that’s when we had to use our brains, and think/plan really interactive activities. When conversing with the staff at the placement site, they told us for this specific group of kids, more than teaching English, they wanted us to focus on building a relationship with them because all of these kids at the site were either from Africa or Bangladesh, and they were socially excluded from society. We were told that many of them come from disadvantaged situations and social difficulties, so the main goal was to just ensure the students had a good time with us. We also had a few social workers working with us at our classes. This experience was extremely different compared to what we experience teaching in Canada, and I am really glad I had the opportunity to teach here and be a part of the students’ lives, and help make an impact, even if it was small. When it came to food, my favourite was chocolate churros. They had a churro spot almost everywhere we went. We had nice crispy churros dipped in warm chocolate sauce at least five times during our trip. My favourite place in Spain was the Real Alcazar of Seville. It was a fortress owned by Muslims in the 1300s but was taken over by Christians and built for King Peter by Christian and Jewish workers. You could see all three religions embedded into the designs of the building; it was so stunning. There was Arabic writing in the walls, the window design had a Star of David in it, and it was such a rich and beautiful learning experience. Overall teaching abroad was phenomenal. I met amazing people and made new friendships, learned a lot about the history of Spain, and had the opportunity to work with such amazing kids! I’m really glad I decided to take on this project.